After a month of anticipation, I am here in Louisville Kentucky for the Bourbon Classic, and so far it has been tremendous fun. We got in late afternoon yesterday, with enough time to check into the beautiful and unique 21c Museum hotel, and get ready for the event itself starting at 7:00. 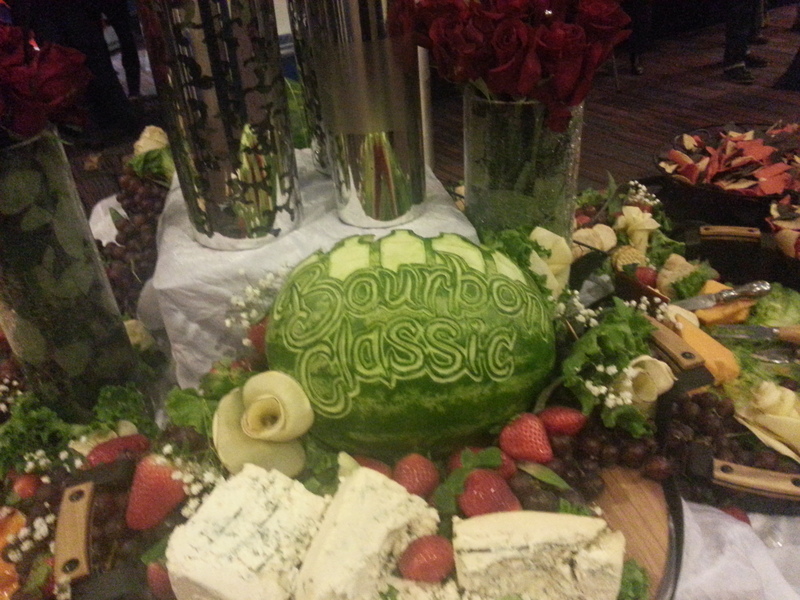 This is the Bourbon Classic’s second year, and the presentation last evening was fantastic. For last night’s sampling and competition, several different bourbon brands pared up with some fantastic chefs and mixologists to prepare small plate tastings and cocktails. Each distillery/chef had a table serving area, and visitors were free to walk up to each one and try the dish, cocktail, or ideally, the pairing of both. The bourbons represented some of the best and most well known in the industry: Angels Envy, Jim Beam, Woodford Reserve, Buffalo Trace, Michters, Blantons and Wild Turkey. 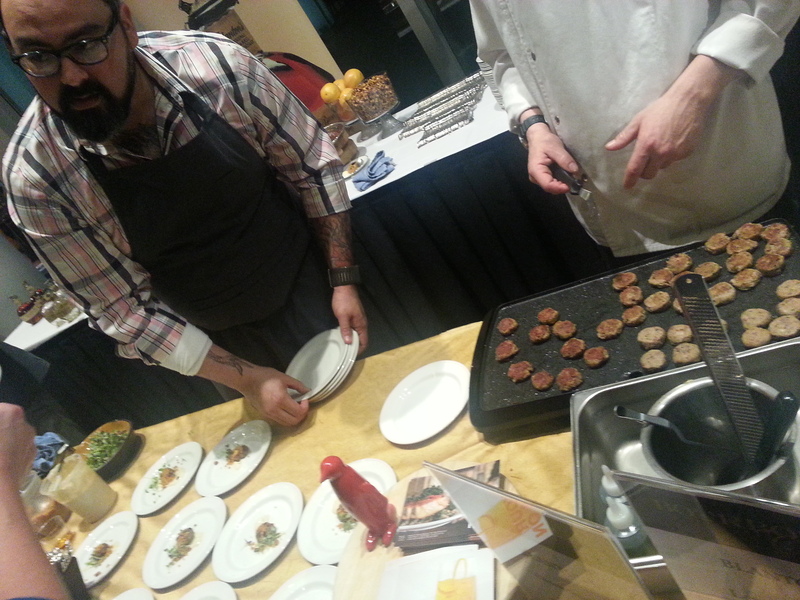 We started out on the far side of the convention hall, with Angels Envy, who served up a beef satay with green chili grits, a deviled egg, and paired it with a Boulevardier cocktail. A delicious pairing for, A.E. and Chef Terry French (winner of the Food Network’s “Extreme Chef” contest in 2012). 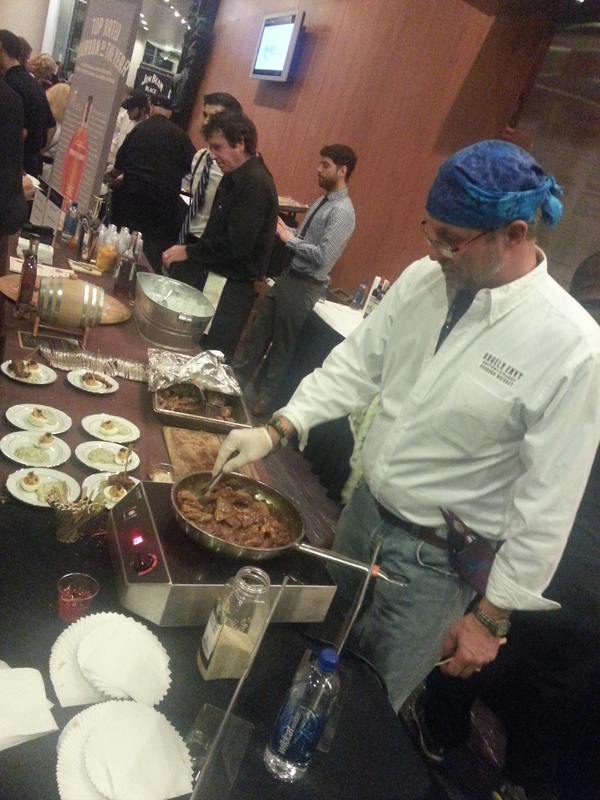 The treats kept coming – Highlights included the Sable Manhattan mixed by Issac Fox of Volare using Jim Beam black (delish! ), Woodford Reserve and Chef Bobby Benjamin paired up for a chicken and waffles that was truly breathtakingly good, and the work of Blantons and Proof on Main Chef Levon Wallace. Now, my love of Blanton’s is known to readers, so it’s hardly shocking I would find this to be my favorite pairing. But the taste of Chef Wallace’s Lamb scrapple with red eye hollandaise and cornbread fried in duck fat, paired with a Blantons based Fancy Free was the highlight for Jen and I. Both were delicious, and went together so nicely, that we had to give Chef Wallace our compliments – and it was our great pleasure to find him to be a fantastic guy to boot! Suffice to say, we look forward to eating at Proof on Main next time we are in Louisville, and enjoying the fantastic foods. After the first pass through, many of the brands and chefs started rolling out second options, and dear reader, that’s where my notes fall off. 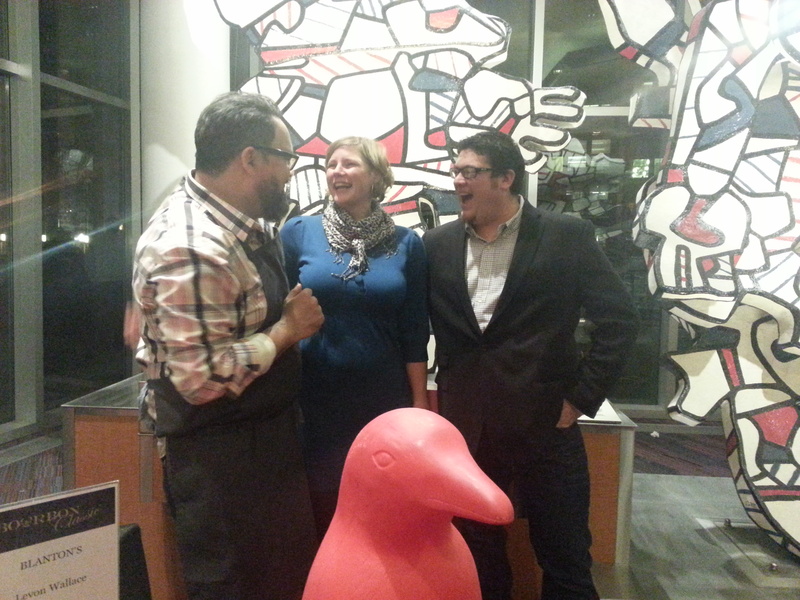 We met some wonderful people, like the aforementioned Issac Fox and Chef Wallace, and made some new friends. We spent a good portion of the evening chatting with Gregory and Chris, two very nice gentlemen from Virginia who headed here for a bit of a college reunion. We also met a pair of ladies who are are close to launch on a Bourbon-lifestyle centered website, and who kindly directed us to some other local cuisine to try. Today is day two, with some learning sessions and more tastings this afternoon and evening. We drove around Louisville a bit today, procured some future bourbon of the week bottles, and ate lunch at the fantastic Garage Bar. We’ve met some wonderful people – from knowledgeable collectors who have helped me augment my own, to the chefs, restaurant managers and people here at the hotel, so far everyone has been fantastic. On to day two!